A radiation dosimeter is a device that measures exposure to ionizing radiation. It is normally worn by the person being monitored as it is a personal dosimeter, and is a record of the radiation dose received. Older dosimeters, such as a film badge, require processing after use to reveal the cumulative dose received. Modern electronic personal dosimeters can give a continuous readout of cumulative dose and current dose rate, and can warn the person wearing it when a specified dose rate or a cumulative dose is exceeded. The personal ionising radiation dosimeter is of fundamental importance in the disciplines of radiation dosimetry and radiation health physics and is primarily used to estimate the radiation dose deposited in an individual wearing the device. 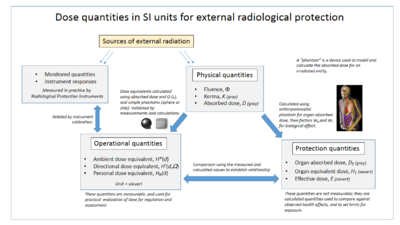 Ionising radiation damage to the human body is cumulative, and is related to the total dose received, for which the SI unit is the sievert. Workers exposed to radiation, such as radiographers, nuclear power plant workers, doctors using radiotherapy, those in laboratories using radionuclides, and HAZMAT teams are required to wear dosimeters so a record of occupational exposure can be made. Such devices are known as "legal dosimeters" if they have been approved for use in recording personnel dose for regulatory purposes. The electronic personal dosimeter (EPD) is an electronic device that has a number of sophisticated functions, such as continual monitoring which allows alarm warnings at preset levels and live readout of dose accumulated. These are especially useful in high dose areas where residence time of the wearer is limited due to dose constraints. The dosimeter can be reset, usually after taking a reading for record purposes, and thereby re-used multiple times. 1. The MOSFET dosimeter is direct reading with a very thin active area (less than 2 μm). 2. The physical size of the MOSFET when packaged is less than 4 mm. 3. The post radiation signal is permanently stored and is dose rate independent. Gate oxide of MOSFET which is conventionally silicon dioxide is an active sensing material in MOSFET dosimeters. Radiation creates defects (acts like electron-hole pairs) in oxide, which in turn affects the threshold voltage of the MOSFET. This change in threshold voltage is proportional to radiation dose. Alternate high-k gate dielectrics like Hafnium dioxide and Aluminum oxides are also proposed as a radiation dosimeters. Film badge dosimeters are for one-time use only. The level of radiation absorption is indicated by a change to the film emulsion, which is shown when the film is developed. Quartz fiber dosimeters are charged to a high voltage, and are usually used for one work period only. As the gas in the dosimeter chamber becomes ionized by radiation the charge leaks away, causing the fiber indicator to change against a graduated scale. These are now being superseded by more modern types, such as electronic personal dosimeters. A thermoluminescent dosimeter measures ionizing radiation exposure by measuring the intensity of visible light emitted from a crystal in the detector when heated. The intensity of light emitted is dependent upon the radiation exposure. Both the quartz fiber and film badge types are being superseded by the TLD and the EPD. The dosimeter plays an important role within the international radiation protection system developed by the International Commission on Radiological Protection (ICRP) and the International Commission on Radiation Units and Measurements (ICRU). This is shown in the accompanying diagram. The protection quantities are used as "limiting quantities" to specify exposure limits to ensure that the occurrence of stochastic health effects is kept below unacceptable levels and that tissue reactions are avoided. These quantities cannot be practically measured and are a calculated value of irradiation of organs of the human body, which is arrived at by using an anthropomorphic phantom. This is a 3D computational model of the human body which attempts to take into account a number of complex effects such as body self-shielding and internal scattering of radiation. As protection quantities cannot practically be measured, operational quantities are used to relate them to practical radiation instrument and dosimeter responses. Operational quantities are aimed at providing an estimate or upper limit for the value of the protection quantities related to an exposure. They are used in practical regulations or guidance. These relate real-life operational instrument measurements and responses to the calculated protection quantities. Personal dose equivalent, Hp(d), is defined by the ICRP as the dose equivalent in soft tissue at an appropriate depth, d, below a specified point on the human body. The specified point is usually given by the position where the individual’s dosimeter is worn. This is an actual reading obtained from such as an ambient dose gamma monitor, or a personal dosimeter. The dosimeter is calibrated in a known radiation field to ensure display of accurate operational quantities and allow a relationship to known health effect. The personal dose equivalent is used to assess dose uptake, and allow regulatory limits to be met. It is the figure usually entered into the records of external dose for occupational radiation workers. The "slab" phantom is used to represent the human torso for calibration of whole body dosimeters. The IAEA states "The slab phantom is 300 mm × 300 mm × 150 mm depth to represent the human torso". Manufacturing processes that treat products with ionizing radiation, such as food irradiation, use dosimeters to calibrate doses deposited in the matter being irradiated. These usually must have a greater dose range than personal dosimeters, and doses are normally measured in the unit of absorbed dose: the gray (Gy). The dosimeter is located on or adjacent to the items being irradiated during the process as a validation of dose levels received. Wikimedia Commons has media related to Dosimeters.